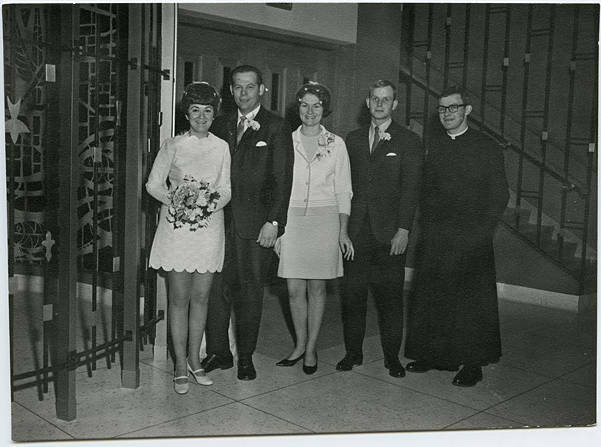 Black and white image of a wedding party standing in the foyer of a church. The bride wears a long-sleeved, lace mini-dress with a scalloped hemline and holds a bouquet of mixed flowers. Her hair is done up in a beehive hairdo and covered by a small net which hangs over the top half of her face and has small flowers on it. Two of the men standing with her wear suits with boutonnieres while the third man is a young Catholic priest in a long, black frock. The woman standing with them wears a short dress (just above her knees) with a jacket and a corsage and a veil similar to what the bride wears. This image is part of the Herbert McMullen bequest. McMullen was a local photographer who owned a studio in Hillsboro; he also collected images of local life taken by other photographers.